Marcell Murányi (pictured) has been appointed editor-in-chief of left-wing daily Népszabadság and its online edition, nol.hu, during an extraordinary general meeting of Népszabadság Zrt. 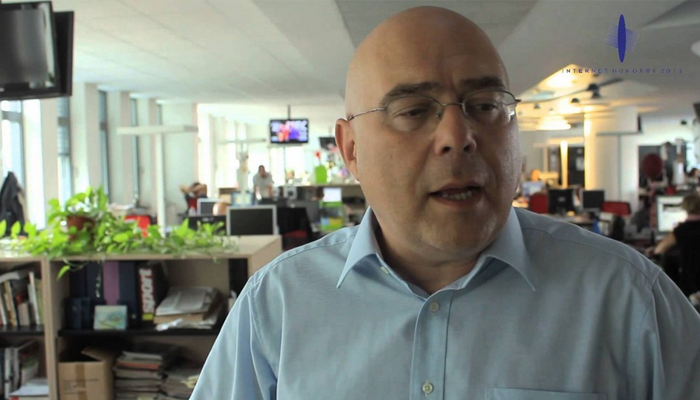 Murányi previously edited daily tabloid Blikk for eight years. Prior to that he was the editor of Vasárnapi Blikk (the Sunday edition of Blikk) and Mai Nap (This Day). Murányi takes over from Levente Tóth who served as acting editor for a year and a half while the daily’s owner searched for a buyer. The appointment follows the sale of Népszabadság along with a dozen other Hungarian media outlets by Swiss publishing house Ringier to Vienna Capital Partners (VCP). It remains to be seen who is behind the acquisition of Népszabadság, but circumstantial evidence points to businessmen connected to Fidesz. Though Murányi’s appointment is surprising considering his past at Hungary’s most popular tabloid, his appointment does not appear to be politically motivated. Nevertheless, questions remain as to the identity of the owner of Hungary’s most popular opposition newspaper. Ringier sold Népszabadság and a number of other national and regional publications to clear the way for its merger with German Axel-Springer AG. After Fidesz came to power in 2010, the newly established Media Authority denied Ringier and Axel-Springer permission to merge on the grounds that the combined portfolio of media outlets would give an “undue advantage” to the new company. Prior to that Ringier attempted to sell its majority interest in Népszabadság Zrt. to the Hungarian Socialist Party (MSZP)-linked Free Speech Foundation. However, the latter was unable to raise sufficient funds and discussions ended. In January 2014 both Axel-Springer and Ringier sold most of their Hungarian publications, including Népszabadság, economics daily Világgazdaság and eight regional daily papers, to VCP, retaining only core segments of popular lifestyle magazines and tabloids in the merged company. After the merger Axel-Springer Ringier appointed former Springer Hungary head CEO. The previous CEO of Ringier left to lead the new VCP media company which employs 700 people, has a combined daily circulation of 230,000 and owns Hungary’s biggest newspaper-printing company as well as a national seller of subscriptions. According to kreativ.hu, VCP regularly acts as a buyer on behalf of third parties wishing to remain anonymous. The fact that prior to this VCP dealt primarily in investment banking suggests it may have acquired 19 publications, many of which were loss making, on behalf of a third party. In addition to owning a major media empire in Hungary, VCP is the majority shareholder (24.2%) of Hungary’s Land and Credit Bank (Föld és Hitel Bank – FHB), followed by the bank’s chairman, Zoltán Spéder (16.3%) who also happens to be the owner of index.hu and portfolio.hu, and president of the company that publishes napi.hu. Spéder is believed to be the mastermind behind last summer’s nationalization of the Takarékbank, subsequently sold to a company in which Spéder has a significant ownership interest. The sale was blocked by the Budapest court pending a Constitutional Court ruling. FHB attracted media attention a year ago when the bank received a capital infusion of HUF 30 billion (USD 130 million) from VCP acting on behalf of an undisclosed investor, thereby enabling the bank to cope with new sectoral taxes while meeting its capital requirements. VCP is rumored to have acted on behalf of Fidesz-affiliated businessmen during the transaction but the connection is still unclear. In a 2013 statement, VCP openly stated that they will “respect the long-lasting tradition of the leftist-liberal Népszabadság” and that they will cooperate with other shareholders, mainly MSZP-affiliated Szabad Sajtó Alapítvány (Free Speech Foundation) in “upholding and developing this tradition”. In the previous years, Népszabadság and its online edition nol.hu was known as one of the most government-critical national media outlets. While ownership issues remain unclear, Murányi’s appointment as editor-in-chief is not a sign of direct interference as nobody in the assembly vetoed his appointment. His journalistic record of breaking celebrity news or exposing private-life scandals makes him an unlikely candidate for the editorship of a daily political newspaper and online site, yet he definitely is Ringier’s preferred choice and person of trust, with no known ties to Fidesz or the pro-Fidesz press.